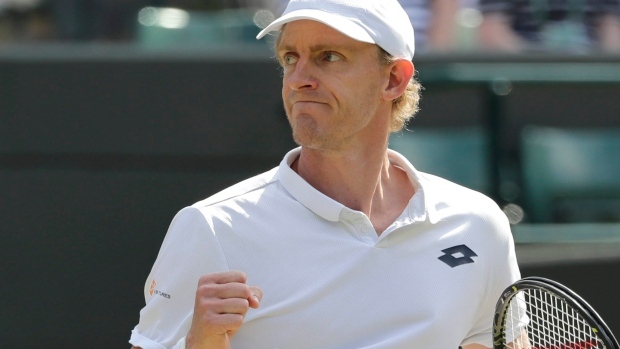 Kevin Anderson outlasted John Isner in the second longest match ever played at Wimbledon, winning the fifth set of their semifinal 26-24 after more than 6 1/2 hours. Anderson became the first South African male to reach the final since 1921 with a 7-6 (6), 6-7 (5), 6-7 (9), 6-4, 26-24 victory on Centre Court. In a final set that lasted nearly 3 hours, Anderson had break points at 7-7, 10-10 and 17-17 before finally earning the decisive breakthrough to go 25-24 up — drawing a massive roar from the crowd. He made it 0-30 in that game by winning a point after falling on his back behind the baseline but still got up in time to return Isner's shot. He then converted his first match point when Isner sent a shot wide — after 6 hours, 36 minutes. The only match to last longer at Wimbledon was Isner's win over Nicolas Mahut in 2010, which ended 70-68 in the fifth set after 11 hours, 5 minutes. Anderson next faces Rafael Nadal or Novak Djokovic. He is the second South African to reach the final, after Brian Norton 97 years ago.